Lets say your server died and you want to export the latest database content from your MySQL instance. Previously you had to install it into some virtual machine and copy your files to the MySQL data dir. Thanks to docker you can quite quickly do this now. Now you have to get the correct version of MySQL running in a docker container. You can get the version by running the ./mysql --version command with the binary from the dead machine, for me it worked using a MySQL 5.6 instance with data from version 5.5.54.
docker run --name some-mysql -v "$PATH_TO_SAVED_DATA":/var/lib/mysql -d mysql:"$MYSQL_VERSION"
Note that even if you pass in a root password, it will not be used because we overwrite the MySQL data files, which means that the passwords will be the same as they were on the dead machine! You can see in the command that we named our container ‘some-mysql’. This means even if we docker stop it we can not start it the same way, you have to docker rm some-mysql before restarting. Alternatively you can remove that part, then get the instance id by looking up it in docker ps. This will give you a console inside the machine. You can use any tools to recover the data. One thing you can not do is to stop the mysql because that will stop the container. You have to manually get and edit the Dockerfile to run mysqld_safe to reset your password. The command above will ask for a password then dump the SQL into the restore.sql file. Why you should automate your side project? I have a few side-projects, mostly websites. They need to be maintained, the server has to be set up, new code has to be deployed. I thought automating stuff I only do once every full moon is unnecessary. This blog is the tell tale of the opposite. I decided to create a new blog around half a year ago but never had time to actually write something, or fix the design, or anything to do with it. What I did though is I automated the deploying of new blogposts, automated setting up the nginx configs, automated setting up the Lets Encrypt certificate. This means now that whenever I have time I can easily just sit down, do my thing, then deploy it with one command. This will help when you decide to migrate your sideproject to another server. I found ansible is the most understandable tool for me, there are already a lot of playbooks for it, also you can easily modify them if you don’t like something. 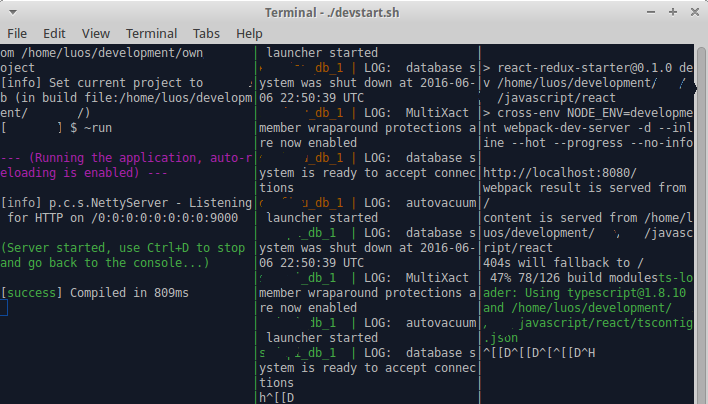 In the end you can just drop back to bash (but try to avoid that). Ansible also can be used to automate deployment. Usually when you have a sideproject, like this blog, it’s a couple of files, or a java jar file, or similar. You can just write an ansible file to create the necessary directories and upload files, reload nginx, all kinds of stuff. When your project gets popular you can easily change. Don’t forget to set up your ssh key on the servers so you don’t forget your password (and it’s more secure). You can use docker to contain all the necessary stuff for all of your components. This makes it portable, you don’t have to worry about accidentally deleting some crucial information which was needed to bootstrap your app (like a db schema which was in a locally installed database which got deleted on an OS reinstall). There is nothing in development you only have to do once, and you will not remember how you did it last time. At least save it in a script deploy.sh. If you don’t really have time for side projects that’s when you really have to reduce friction. Friction of development, friction of deploying. Everything. When I want to start something I want to start it immediately, not trying to figure out how I ran something half a year ago. I want to see my changes in production. I think you should always strive to do best practices when working on your own, in your free time, but you have to know when it is good enough. It depends on the goal why you are doing it. My sideprojects are mostly learning projects, therefore I strive to implement everything the best possible way I can imagine in the minute, but try not to get too caught up in this. Perfection is the enemy of done. Stripe, the payment provider, origanised a CTF, where you could the basics of distributed systems. One of the tasks was to write a bitcoin-ledger-like implementation based on git. If you are not well versed in the git implementation, then you should know for this that git creates an object for every commit. This commit contains a sha hash of the contents you are storing plus the hash of the related information. This information contains the user, email, and commit message. In bitcoin mining you always want to generate a hash which is less than some kind of constant. For example if you generate hash “123” and requirements contain “001” then your hash is not accepted as it’s not less than the required threshold. In this tasks we had to generate an sha hash less than the required threshold which as “000001”. If we accept that sha hashes are random then it this task actaully says that we have to generate around 16 million hashes in the time they set us, which was around a few minutes. In this problem we had to write a gitcoin miner and we had an example miner which was really slow. First I thought it would be good to use Scala/Akka to pass the Tasks around. My plan was to fill up an Actor system and let it handle the hashing using the sys.process package and some commands from the supplied bash example. For some reason it was a complete fail, the Actor got full and used up all my memory and never done anything, in the end I had to shoot this idea (and the process too :) ). This has never used more than a couple of percent CPU, I don’t know why, maybe git locks the files in the repo? After this I got the idea to rewrite the git hash-object part in scala, and in the end it worked out. The first value is the tree, we can obtain this with “git write-tree”. The second value is the parent of the commit, we can obtain this with “git rev-parse HEAD”. The other things in this were just placeholders and the goal was to change the last part of the commit to get a hash with git hash-object which is lower than “000001xxxxxxxxxxxxxxxx…”. This means that the hash must be lower than the string “000001″. This is difficult because the only way to obtain the correct info to get the needed hash to try as many hash as we could in the shortest time possible. Now we know whats needed by the git hash-object function, we have to know what is the format used to calculate the hash. Turns out git prepends a “commit (body-length)\0″ string to the commit body, so thats what we have to do and we are good to go. val cmd = "git hash-object -t commit --stdin -w <<< \""+cbode.trim()+"\";git reset --hard \""+hash+"\" < /dev/null; git push origin master;"
I imported the scala.sys.process._ methods/packages to easily run commands. You can see the syntax in the first couple of rows. After assembling the body of the commit I started a parallel for to use my all my CPU cores ( 2. gen mobile core i5). Turns out its approximately 261 kHash/sec. I don’t know if it counts as fast, it was enough to get a winner commit. In the end I committed by hand because there was some trouble with the endline character and sometimes it was needed at the end of the commit, sometimes not. Strange. I like backend development and devops more than frontend but I designed this blog. Hope you like it.